Well, maybe not, but there’s no prizes for guessing what I did last Sunday. 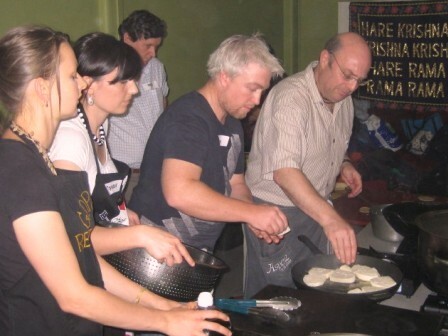 I taught the second of my new season’s big classes at Gopal’s Restaurant in downtown Melbourne. We had a great time. 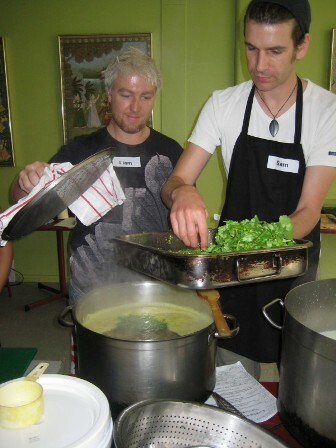 That’s Sam and Liam adding fresh things to the dal. That fine golden spray of magic faery dust is the famous asafetida. I just can’t live without it. I like this shot. It sort of sums up the flavour of my classes. We’re all united in a single purpose – in this case, getting those panir steaks done so we can sit down to lunch! Twenty-four happy punters line up for the grand finale. 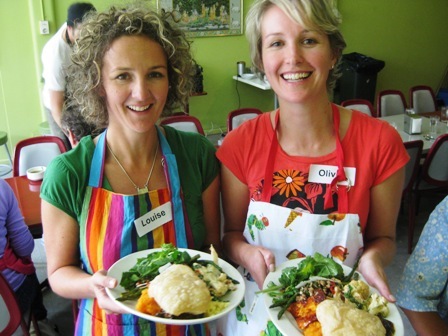 Colourful sisters Louise and Olivia poised for lunch. Thanks to Crystal for supplying some of these photos. A few places are still available for the next Gopal’s class on Sunday May 3. Don’t miss the fun!